A special school is a school that is specially organised to make special educational provision ('SEP') for children or young people with SEN. Specials schools can by maintained by the local authority ('LA'). 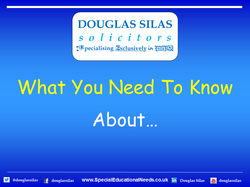 There are also a number of independent special schools as well as non-maintained special schools. Special schools aim to tailor education to a particular child or young person’s needs. They may be specialised in dealing with a particular form of disability or SEN. Furthermore, special schools typically have smaller class sizes and staff are often more experienced in dealing with different types of SEN or disability. Children and young people with SEN can feel more at ease learning alongside others with similar needs or problems. However, parents and young people do need to be aware of the particular specialism of individual schools and whether or not the facilities are appropriate to meet their specific needs. This can happen but in practice it is quite rare. During the assessment process for an EHC Plan it may be the case that a child or young person is admitted to a special school. Moreover, certain academies include in their agreements a policy to allow admittance to children or young people without an EHC Plan or Statement. Certain hospitals have special schools established on site, which children or young people with SEN may attend when at the hospital.